TUESDAY: 8.30am THE Bundaberg region was drenched with more than 340mm of rain in 24 hours, causing havoc for residents and emergency services. Roads became flooded, homes and businesses were inundated with water and a mini tornado tore through Avenell Heights leaving behind a massive clean up. The weather event has been recognised as Bundaberg's biggest one-day downpour in more than half-a-century. 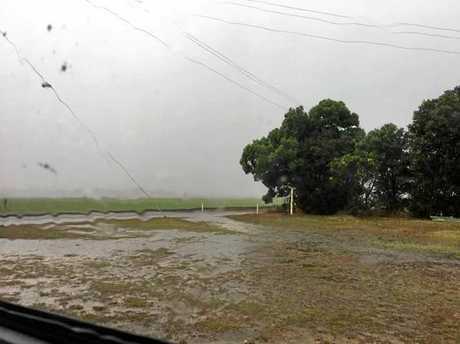 A Bureau of Meteorology spokeswoman said the Wide Bay region received more than 340mm rain on Monday, breaking a 64-year record by more than 60mm. The SES responded to about 177 calls in the area on Monday and overnight, mostly due to roof damage and flooding, and more than 5000 homes lost power at the height of the wild weather. 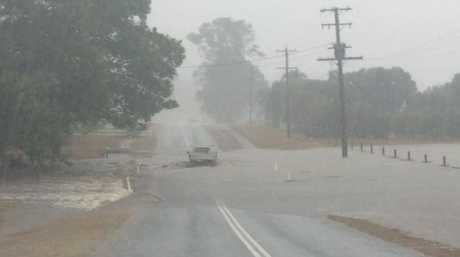 Flash flooding closed main roads into the town of Agnes Waters, including Rosedale Rd into Bundaberg. Despite the heavy rain, Bundaberg Regional Council said there would not be any flood event in the Burnett River in coming days. Council took to their Facebook page last night to keep residents up to date with the weather situation. "All data recorded by Council as a result of the soaking demonstrates that this very heavy rain has not fallen broadly across the Burnett River catchment," the post stated. "Council investment in its river/rain gauge network helps provide this level of information." "The data shows that, while Council will have some work to do cleaning up from this flash flooding/wind event, we won't be dealing with riverine flooding later this week. The post said Council was yet to receive any estimates of damage to its infrastructure. "On the positive side, the bushfire situation the region has been wrestling with has significantly eased and there has been welcome inflows into local dams and storage areas," the post said. While all is calm for now, Higgins Storm Chasing has stated more rain is on the way for South East Queensland. "It's not over yet with scattered showers and storms around this afternoon," their Facebook post said. "Some storms may be severe with heavy rain and flash flooding under them." EMERGENCY crews are taking a number of reports of water over roads and continue to place road closure signs around the region. The latest road to close is Fe Walker St, close to Elliott Heads Rd, the drains in the area are filling with water and there is about a foot of water over the road now. Emergency services were busy with calls to a number of cars stuck in rapidly rising flood water and crashes around the region. Just after 3pm emergency crews responded to reports of a two-car-crash on the Bruce Hwy between Gin Gin and Childers. Then the mayhem continued with several calls for help as people were stuck in flash flooding around the region. 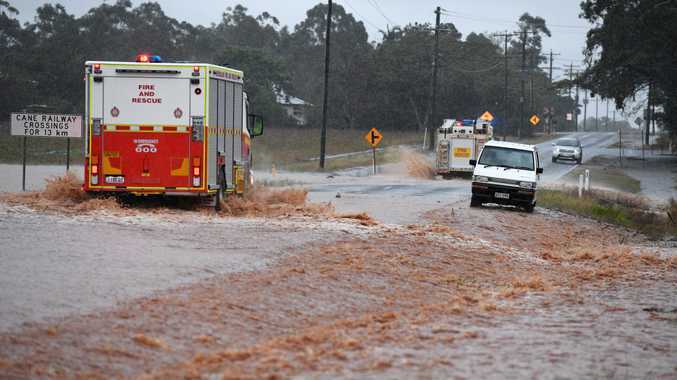 A Queensland Ambulance Service spokesman told the NewsMail the calls for assistance came in fast as the rain took hold. He said a number of crews responded but no one needed transporting to hospital. 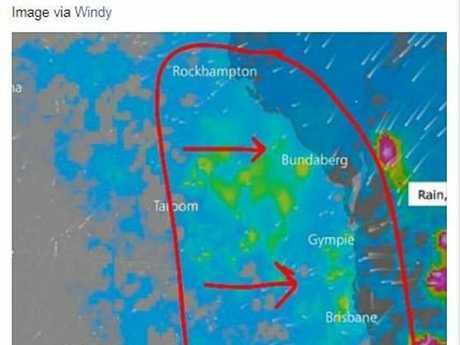 UPDATE: 5.20pm THE people on the Alliance flight which was turned around before landing at the Bundaberg airport are now stranded in Brisbane as the wild weather continues. NewsMail Editor Craig Warhurst and a crew of 60 plus people are not too happy about the news they will have to find a Brisbane place to stay until at least the morning. QUEENSLAND Fire and Emergency Services (QFES) crews, including Fire and Rescue and the State Emergency Service (SES), have responded to numerous incidents across the region following the severe storm and heavy rainfall that is now affecting the area. SES crews have been called to respond to more than 90 tasks, including roof damage and minor house flooding. Fire and Rescue crews have responded to reports of fallen powerlines. Motorists are advised that some roads are flooded and to drive with caution and to conditions. Never drive, walk or ride through flood waters and keep clear of creeks and storm drains. Queensland Police have taken to social media to warn people about road closures and localised flooding. The post says there is a number of areas with localised flooding between Agnes Water and Bundaberg, including the Bruce Hwy, Fingerboard Rd, Tablelands Rd and Rosedale Rd. They are asking people to avoid the area and delay travel. New reports there is 400mls of water over the road at Elliott River, Goodwood Rd. THE road at Yellow Creek Hole on Goodwood Rd is now closed. Motorist are advised to avoid the area. REPORTS the water is starting to run really high on Maryborough St, Bundaberg central. A call for sandbags has been sent out to assist residents. Flooding at Hinkler Central car park: Hinkler Central car park is flooded. A QUEENSLAND Emergency Service spokesman said the swift water crew were on stand-by at the Bundaberg station. He wanted to drive the message "if it's flooded forget it' home after a number of cars were reported swept into flood waters. Hinkler Central car park is currently filling with water. GOODWOOD Rd is closed and people are advised to stay away from the area heading south of Bundaberg. Bundaberg SES deputy local controller Narelle Field told the NewsMail Goodwood Rd was closed and the Elliott River was rising. "The council are heading out there now with road closure signs," she said. "The SES have heard reports of a number of roofs have been blown off and powerlines are down around town." FLASH flooding has hit Bundaberg as the rain continues to pour. NewsMail reporter Ross Irby said the water was rising in low lying areas. He took photos of drains near Hinkler Central that had filled with rapid water. The high tide is due to hit the coast at 6.30pm and there are fears the water in the drains will rise higher. UPDATE 3.25pm: REPORTS of a two car crash on the Bruce Hwy have come in. The crash happened about 3.10pm on a bridge between Gin Gin and Childers. Emergency crews are on the way to the scene. UPDATE: AN ALLIANCE flight from Brisbane has been turned around just before landing because of the wild weather. A person on the plane contacted the NewsMail saying they just missed the landing and the plane was now heading back to Brisbane. "Can't land the weather is too bad," he said. 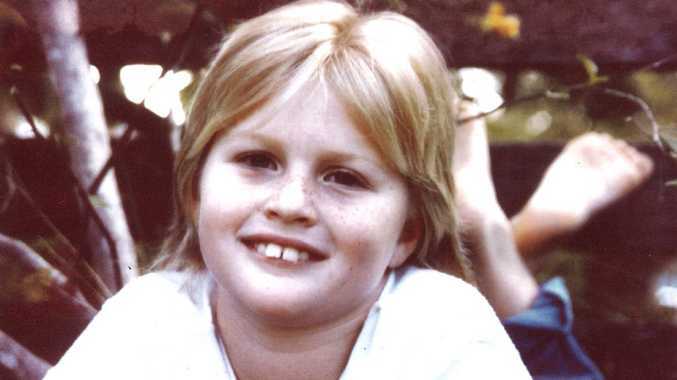 "We were about to land and they aborted." He said it was too wet and there were not able to see the airport from the plane. "Bumpy ride coming in and out," he said. "Captain sad we have to return and wait for weather to clear. "It's not a good day for flying." He said the plane was full of Bundy people returning from NRL grand final and everyone on board was pretty cool and no one was panicking. "Alliance and Virgin will reassess another flight once we land back in Brisbane," he said. POLICE are heading to reports of multiple cars in rising water around Bundaberg. The wild weather has caused havoc on Bundaberg roads as a number of cars have been caught in flash flooding. It is believed the swift water crew is heading to Rosedale Rd, where a car has been swept into water. Another report says bitumen has lifted off the road on Branyan St.
A number of reports powerlines are down across the town. People are advised to stay in side their homes. A Qantas plane flying in from Brisbane has been turned around. Shops along Takalvan St have had water go inside the premises.